Thanksgiving is just around the corner and many of us start stressing about how we will deal with all of the food AND dessert. Don't fret, there are easy ways to enjoy a hearty Thanksgiving meal without losing all of your momentum. It's all in your mind, so decide now that you won't lose control. Make it easier on yourself and insist on preparing healthy side dishes that you know are good for you. As Benjamin Franklin would say, Fail to Prepare, Prepare to Fail. When you eliminate obstacles, you empower yourself toward achieving your goals. Instead of putting yourself in a situation where you are "forced to make a bad decision" or "left with no choice" forge your own path and make sure you're never in that position. You can find some great healthy side dish recipes in our No Regrets Thanksgiving post here. Life is too short to be worrying about calories every waking moment of the day. This is your time to exert your self control WHILE enjoying the holiday with family and friends. They aren't mutually exclusive ;D Food is fuel, so eat well with the intention to live well. Here's to a HAPPY Thanksgiving! A potato masher or small food processor are helpful tools for this recipe. A small food processor and glass bowl with lid are helpful tools for this recipe. A cast iron skillet is a helpful tool for this recipe. We all have our rituals, some of them positive, others negative, and most just keep us in holding patterns that leave us stagnate. If you want lasting change you need to commit. Decide on what you want, make a plan, and do it. Day in and day out. The process of conditioning ourselves feels incredible, especially when you experience that initial momentum, but most people never reach that. Because getting to that momentum takes time. On average, people give up after 2-3 weeks of consistent training (this goes beyond working out) after not "seeing results" they were expecting. The problem is focusing on counting the days rather than fully committing. Knowing that you have committed to living a healthier and more fulfilling LIFE both in body and spirit, you hold yourself accountable each waking day. Not tomorrow, a week from now, or even a year. If you want lasting change you have to give up the idea of just trying something. Commit to MASTERING it. STEP UP and discover what you're capable of. If you are ready for a change join the TBW club today. Winter is approaching and many of us want to retreat, hibernate, and comfort ourselves with delicious food. This can and should happen, but of course in moderation. Don't use the changing season as an excuse to not exercise. Here are a few great tools that will help you maintain your active lifestyle in the comfort of your own home so there really is NO EXCUSE to not SWEAT. For optimum results, exercises should be paired with a good nutrition program. If you need guidance or just a change in your routine, JOIN THE TBW CLUB TODAY. 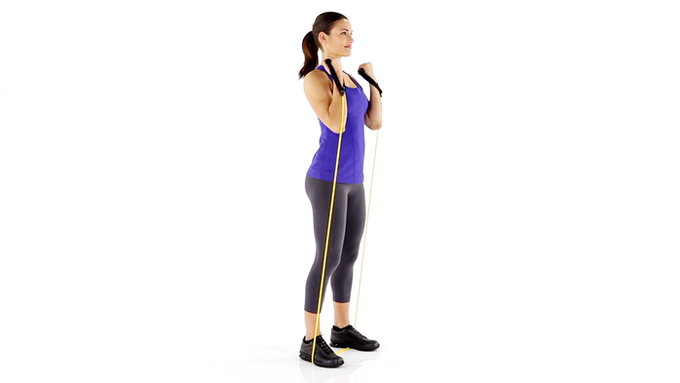 These bands are perfect for standing or seated upper (shoulder press/raises, bicep curls, triceps extensions, rows, etc) and lower (overhead squats, donkey kicks) body workouts without heavy weights. The resistance challenges your muscles beyond your own body weight, which stimulates muscle growth. The closed loop is great for lower body workouts: squats, lateral squats, standing kick backs, donkey kicks, lying hip abductions, russian twists, etc. This weight allows you to incorporate cardio and strength training all into one session. For a great leg workout try supersetting swings with goblet squats using a kettlebell. Pull ups are a great complex upper body workout engaging multiple muscle groups (biceps, deltoids, shoulders, back) at once. You can also use the bar to do hanging core workouts by extended leg raises, knee ups, or a controlled jog. If you can't do a pull up, use a closed loop resistance for assistance and work your way off it. Having a soft surface allows you to do a many exercises that require the support of the floor. From stretching to core to upper and lower body workouts. Combine all ingredients in a bowl. Transfer to pan, sprayed with cooking spray. Top with optional extra pecans. Bake 15–20 minutes, until browned on top and cooked through. This loaf is also tasty slightly undercooked! Bodybuilding is a process, perhaps a sport, by which a person shapes her or his own body. This shaping is always related to the growth of muscular mass...[and] can be seen to be about nothing but failure. A bodybuilder is always working around failure. I want to fail...I want to shock my body into growth. Every day, in the gym, I repeat the same controlled gestures with the same weights, the same reps,... The same breath patterns. But now and then, wandering within the labyrinths of my body, I come upon something. Something I can know because knowledge depends on difference. An unexpected event. For though I am only repeating certain gestures during certain time spans, my body, being material, is never the same; my body is controlled by change and by chance. My unexpected failure at the sixth rep was allowing me to see, as if through a window, not to any outside, but inside my own body, to its workings. I was being permitted to glimpse the laws that control my body, those of change or chance, laws that are barely, if at all knowable. By trying to control, to shape, my body through the calculated tools and methods of bodybuilding, and time and again, in following these methods, failing to do so, I am able to meet that which cannot be finally controlled and known: the body. In this meeting lies the fascination, if not the purpose, of bodybuilding. To come face to face with chaos, with my own failure or a form of death. Very excited to be working with the amazingly talented Randi Shandroski of LACTIC INCORPORATED again for New York Fashion Week and the NPC Brooklyn Grand Prix. Super excited to be walking in LACTIC's first NYFW runway presentation hosted by VERGE at the Brooklyn Museum's Beaux-Arts Court in a custom bikini. 11am Pre-judging Athletes present their package to be judged by a panel of 8-10 judges. This portion is very business like, no theatrics like the finals, just straight forward walking and scoring. Bikini usually goes first because it is the largest class. If you can't make it to the evening show, this is your best bet. 6:30pm Finals Athletes execute their routine and winners are announced. Bikini usually goes last since it is the most popular. If you are planning on coming to this show, plan on sticking around till 10:30pm or midnight. Below are some images from our first collaboration at the NPC Southeastern Championships in 2014. NUTRITION: WHAT DOES YOUR GROCERY LIST LOOK LIKE? Clean eating is not as hard as it sounds. The focus is on whole, nutrient rich, minimally processed foods that fuel both your mind and body. Tip: Whenever possible choose organic or natural grass-fed beef or lean chicken and turkey breast. If you are incorporating red meat into your diet, opt for 95% or higher lean beef. Nut Butter (Almond, Peanut, Cashew) No added sugar or salt.